Combining years of experience singing, directing, and playing instruments in choruses, choirs, solo and ensemble performances, Lynn, Toni, Terri, Elisa and the two Lindas evoke emotion and energy through song. From spirituals to freedom songs, from music that fights hate to songs that inspire transformation, Cymbal's music points to the values of justice, hope, and spirit. Cymbal’s musical repertoire includes folk, South African, Native American, traditional Appalachian, spirituals, and original compositions. The group demonstrates vocal dexterity in its acappella pieces, and members play a variety of instruments, including guitar, piano, dulcimer, mandolin, harmonica, percussion instruments, and jug. 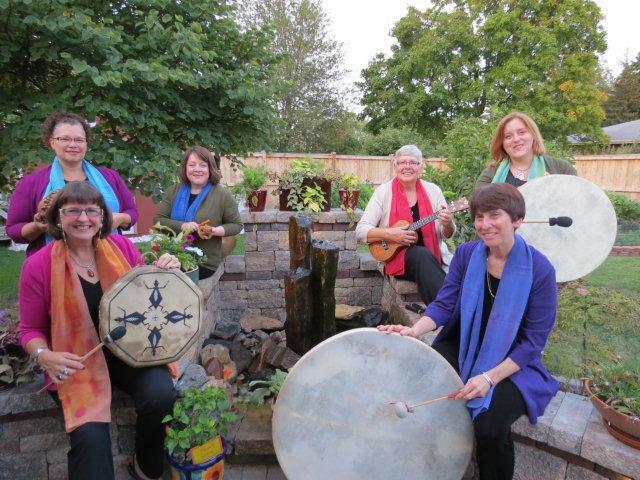 Cymbal sings original works by Unitarian Universalist composers, highlighting their contributions to promote religious diversity and spiritual empowerment.